In contemporary practice, implant quality assessment relies on dose-volume quantifiers estimated from image data acquired after the operative procedure. Because of the importance of these quantifiers, current practice guidelines issued by American Association of Physicists in Medicine (AAPM)  and Groupe Européen de Curiethérapie of the European Society for Therapeutic Radiation Oncology (GEC-ESTRO)  recommend that post-implant dosimetry be performed for all TIPPB patients. Dose should be calculated using the TG-43 formalism at a single time point lying within a radionuclide-dependent time interval chosen to mitigate the effects of edema. GEC-ESTRO recommends waiting until edema subsides before calculating dose; however, this approach might not yield accurate dosimetry for Pd-103 and Cs-131 implants. AAPM recommends an "optimal" time interval within which to calculate dose; however, the recommended interval does not accommodate the full range of variation in edema dynamics reported clinically. Neither AAPM nor GEC-ESTRO guidelines address the possibility of seed movement within the prostate apart from that induced by edema (herein referred to as "seed movement") during the course of radiation delivery. 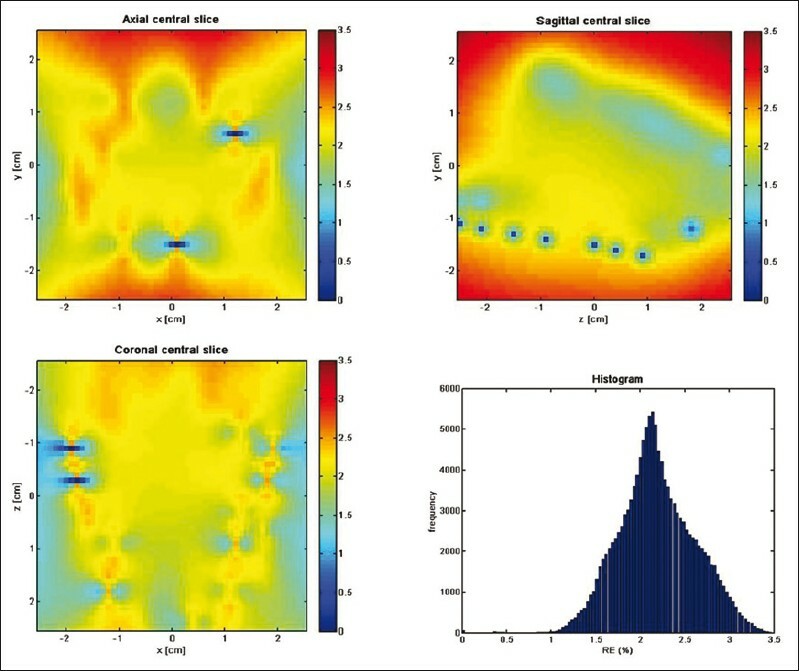 This article provides an overview of the impact of edema and seed movement on the dosimetry of prostate implants and reports the initial clinical application of a new edema model developed for the purpose of refining implant dose calculations using an extended TG-43 formalism. First, a brief description of the pre-planning approach to TIPPB taken at our center is presented. This is followed by a review of edema and seed movement literature as it pertains to implant dosimetry. Then, the new edema model  is applied to calculate dose distributions for selected I-125 implants done at our center. Results are reported in terms of parameter RE, which quantifies the dosimetric error which occurs when edema is neglected and dose is calculated after edema has resolved, and in terms of changes in dose parameters V 100 , V 150 , V 200 , and D 90 . The impact on dosimetry of varying edema magnitude and of using Pd-103 instead of I-125 seeds is also briefly examined. The article concludes by summarizing current practices aimed at mitigating the impact of edema and seed movement on dosimetry and indicating possible future means to include these effects explicitly in clinical dose calculations. At our center, permanent I-125 seed implants have been used as monotherapy treatment for low-risk or low-tier intermediate-risk prostate cancer since 1998. The dose prescribed is 145 Gy,  and a pre-planning approach is taken that makes use of a set of 5-mm-thick transrectal ultrasound (TRUS) images acquired approximately 4 weeks before implantation. The treatment planning process involves defining a planning target volume (PTV) by adding 3 mm margins to the prostate contours anteriorly and laterally and a 5-mm margin at the apex, and visualizing the urethra using aerated gel. Needle locations are chosen from among those on a standard template grid falling no more than 2 mm outside the prostate contour at mid-gland. A custom plan is created manually for each patient to meet the dose-volume objectives given in [Table 1] using a fixed seed strength of ~0.5 U for all patients. Needle spacing on the template grid and seed spacing within the needles are not strictly constrained by "rules;" however, these are made as uniform as planning objectives will allow. The approach taken to seed strength selection and seed placement, which can be characterized as falling somewhere between the modified uniform and peripheral loading schemes, ,, is based on clinical and dosimetric considerations summarized in  . A typical treatment plan for an average-sized prostate gland is illustrated in [Figure 1]. Currently, implants are done with pre-loaded needles containing stranded seeds and post-implant dosimetry is performed on the day of implant (day 0) for all patients. A pelvic computed tomography (CT) scan having 3 mm slice thickness is obtained to visualize the prostate, seeds, and surrounding anatomical structures. A urinary catheter inserted in the operating theater typically remains in place for imaging to delineate the path of the urethra. [Figure 2] illustrates day 0 post-implant dosimetry for the patient whose planned dosimetry is shown in [Figure 1]. While not routinely used at our center, magnetic resonance imaging (MRI) is employed occasionally to plan a supplementary implant when post-implant dosimetry for the initial implant reveals inadequate dose coverage. In this situation, T2-weighted MR images are registered with ultrasound and CT images from the initial implant to facilitate identification of the supplementary implant PTV. The Medline© database of indexed medicine and health sciences literature was searched to identify pertinent articles. For prostate edema, the keywords "prostate implant," "edema," and "dosimetry" were used in the search strategy. For seed movement in prostate and peri-prostatic tissue, the keywords "prostate implant," "seed movement," "seed displacement," and "dosimetry" were used. Key articles were then chosen from the search results and supplemented by references selected from those cited therein. Each article's core content was then summarized and the summaries organized to create an overview of current knowledge concerning the impacts of edema and seed movement on prostate implant dosimetry. (ii) that a seed implanted at location follows the movement of its surrounding tissue in all three Cartesian directions without further migration, i.e. where S K is the air-kerma strength of the seed, Λ the dose-rate constant, r0 the reference distance (usually 1 cm) for dose calculation, the average anisotropy constant, λ the time constant for radionuclide decay, and g(r) is the radial dose function accounting for additional dose fall-off beyond the geometrical reduction. Substituting Equations (2) and (3) into Equation (4) and evaluating the integral enables the dose around a single seed to be calculated in the presence of edema for specified values of Δ and T. The total dose D∑ to a calculation point is obtained by summing over all seeds in the implant. With this definition, RE is always positive and indicates that the dose estimate obtained when edema is neglected overestimates the dose obtained when edema is considered. Some potential implications for the clinical dosimetry of I-125, Pd-103, and Cs-131 implants in the presence of edema described by the above model were previously reported  using a reference configuration of seeds defined by the Radiological Physics Center (RPC) for the purpose of credentialing institutions participating in North American prostate brachytherapy clinical trials. In the present work, the edema model is applied for the first time to selected clinical implants. For three prostates implanted with 0.5 U I-125 seeds (Oncura model 6711) and having volumes of 18.9 cc, 37.6 cc, and 60.2 cc, RE given by Equation (5) was calculated for both pre- and post-implant dose distributions for a single edema period T = 28 d, and relative edema magnitudes Δ = 0.2, 0.4, 0.6, and 1.0. For pre-plans, RE represents the dose error associated with edema for a "virtual" implant in which the geometrical arrangement of seeds is exactly as planned. All RE calculations were done in a 50 × 50 × 50 mm 3 volume centered on the seed distribution using 1 mm grid spacing. Seed coordinates exported from the clinical treatment planning system (VariSeed v8.0, Varian Brachytherapy, Charlottesville, VA, USA) were used to place seeds exactly on grid positions for the pre-plans, and to snap seeds to the nearest grid position for post-plans after applying a transformation (using Equations (2) and (3) with Δ = 0.2 and T = 28 d) to estimate seed positions at time t > T from those measured on day 0 (t = 0). Mean values of RE were determined for the entire calculation volume and for the upper 10% of RE values in the volume. Dose parameters V 100 , V 150 , V 200 , and D 90 for PTV (pre-plan) or prostate (post-plan) were then calculated using the CERR software platform (http://www.cerr.info/about.php) using structure contours exported from VariSeed. 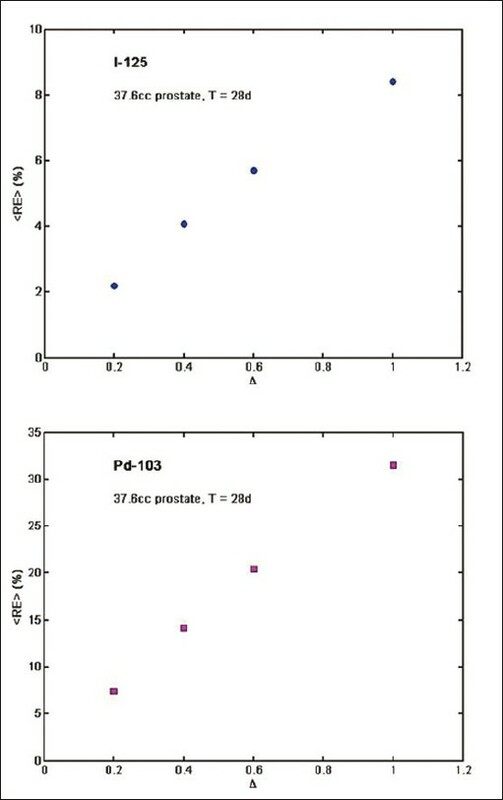 Calculations were repeated for the 37.6 cc prostate with the exact same seed configuration but using Pd-103 seeds (Theragenics model 200) of strength 2.5 U instead in order to obtain comparative data for a hypothetical Pd-103 implant. By way of further comparison, corresponding results for the isotropic edema model of Chen et al.,  adapted to reflect the time resolution of edema described in Equation (2), were also obtained. The swelling of prostatic and peri-prostatic tissue that accompanies a TIPPB procedure is understood to be caused by mechanical insult associated with needle introduction. In a small study involving N = 28 implant patients, Eapen and colleagues  found a statistically significant correlation between acute urinary toxicity and the total number of peri-urethral needle insertions / manipulations performed. A plausible explanation for their finding is that edema magnitude is directly related to the number of needle manipulations and the ensuing edema is responsible for the observed urinary toxicity. As demonstrated,  edema can have a considerable influence on prostate implant dosimetry, depending on its magnitude and time course and, for post-implant dosimetry, on the timing of post-implant imaging. The influence of edema on dosimetry also depends to a large extent on the radionuclide selected for treatment. In general, the influence of edema becomes greater as the half-life of the radionuclide becomes shorter  because a larger fraction of the treatment dose is delivered when the prostate is in an edematous state. Therefore, it is important to accurately quantify edema for dosimetric assessment purposes. In that regard,  contains an extensive review of edema magnitude, time course, and spatial isotropy measurements reported in the literature. The summary following is drawn from that review. The combination of pre-implant TRUS and post-implant CT images has been used most often to measure edema characteristics. When derived from prostate contours delineated on these images, average relative edema magnitude obtained within 24 h after implant for different groups of patients ranged from ~0.15 to ~0.65, and when derived from contours delineated on (pre- and post-implant) TRUS images alone ranged from 0.05 to 0.30. CT alone has also been used to infer relative edema magnitude from measured changes in inter-seed distances,  as have orthogonal film pairs. 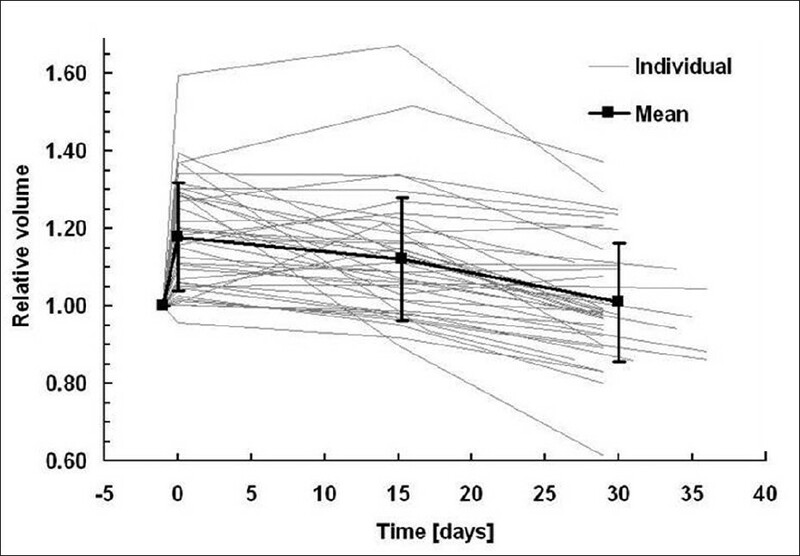 For these approaches, average relative edema magnitude obtained within 24 h ranged from ~0.20 to ~0.50. More recently, in some centers, MR images have been registered with CT to improve contouring accuracy for post-implant dosimetry purposes, while TRUS images have continued to be used to determine pre-implant prostate volumes. Average relative edema magnitude obtained within 24 h after implant from TRUS / MR contours ranged from 0.08 to 0.45. Only two published studies have made use of MRI alone to measure relative edema magnitude and both indicate a value ~0.2 within 24 h of implant. Such large variation in observed edema magnitudes can be partly attributed to technical factors such as number of seed trains used, seed insertion method, presence of stranding material, and patient tissue mechanical properties. However, a second and perhaps equally important contributor to this variation is measurement uncertainty, which the literature collectively indicates is imaging-modality specific. For the contour-based measurement method, MRI is expected to yield the most accurate results and CT the least accurate. The time course of prostatic edema has also been measured using various combinations of TRUS, CT, radiographic, and MR images. Some studies indicate that edema resolves inverse exponentially with time, others that it resolves linearly, and still others that it does not follow a discernable trend. Average edema half-life (defined as the time interval over which edema magnitude falls to 50% of its maximum value) reportedly varies from 9.3 to 30 days. Half-lives for individual patients span a wider range from 4 to 170 days. Measurements made at our center based on sequential MRI  are consistent with linear time resolution of edema having a half-life of 15 days, as shown in [Figure 3]. Model edema in space and time (see e.g. Section "Anisotropic edema model") and use the model to extend the TG-43 dosimetry formalism, ,, as is done here in Equation (4). The first two approaches, while providing compensation for edema, do not improve the accuracy of dose calculations. The last approach which is followed in Section "Relative dose error due to edema" under "Results and Discussion," does. The question of whether seeds placed within and adjacent to the prostate move over the course of radiation delivery, apart from movement associated with edema, has been studied by several groups. At present, investigators appear equally divided in reporting the presence or absence of seed movement sufficient to affect dosimetry. Many of those reporting significant seed movement have noted that the observed movement could be associated with specific features of the implantation technique. Fuller and colleagues  used orthogonal films and CT obtained on day 1 and orthogonal films obtained 3-12 months later to measure the prevalence of migration of loose and stranded (IBt InterStrands) seeds for N = 60 patients. Seed migration was defined as the separation of a seed from the main seed cluster by >1 cm. Using this definition, 0.49% of the seeds were found to migrate on or before day 1 and an additional 0.27% later; migration distances were not reported. Stranded seeds were found to migrate less frequently than loose seeds, although the dosimetric consequences were described as modest. McLaughlin et al. employed CT/MRI fusion dosimetry on days 0 and 14 to study the impact of edema on dosimetry of stranded seeds (Oncura RapidStrand) for N = 28 patients. Z-axis compression of strand length and a tendency toward an inferior shift of strands were observed for many patients. The magnitude of these seed movements was such that the authors concluded they had a greater impact on post-implant dosimetry than did prostate edema. A disclaimer is made that results might not apply to loose seeds. Pinkawa et al. used CT imaging on days 1 and 30 to measure the displacement of loose and stranded seeds (Oncura RapidStrand) with respect to pelvic bony anatomy for N = 51 patients. Seeds near the prostate apex were stable over time relative to bone, but those near the prostate base moved inferiorly an average distance of 3.8 mm while the base itself moved an average distance of 3.5 mm inferiorly. Displacements were found to be greater in the inferior and posterior directions for stranded seeds versus loose seeds. The authors claim their analysis shows seed displacement to be another important factor besides edema in explaining dosimetric changes after permanent seed implantation; however, the analysis does not appear to clearly separate these two factors. Crook's group at Princess Margaret Hospital  applied CT/MRI fusion on days 0, 7, and 30 to study the movement of loose and stranded seeds (Biocompatibles VariStrand) and the impact on dosimetry for N = 40 patients. Seed losses of 1.1% and 0.6% were observed in the stranded and loose seed cohorts, respectively; the urinary tract was identified as the primary site of loss. In both cohorts, dosimetric quality parameters showed the largest deterioration from pre-plan values on day 0 and gradual improvement as edema resolved. For some patients, significant caudal movement of strands with time was observed. Usmani et al. observed the movement of 232 seed strands (Oncura RapidStrand) with respect to implanted gold fiducial markers on CT between day 0 and day 30 for N = 10 patients. Strand movements were found to be consistent with those caused by edema resolution, with 84% of strands migrating <5 mm in any direction. The authors concluded that no clinically significant patterns of mean migration were identified. Finally, Vassiliev and co-investigators  observed the movement of 72 peri-urethral strands (Biocompatibles VariStrand) with respect to penile bulb and base of prostate on day 0 and day 30 CT supplemented with day 30 MRI for N = 10 patients. The mean displacement of peri-urethral stranded seeds relative to prostate did not exceed 1 mm in any direction and only two strands were displaced more than 4 mm. Several investigators reporting dosimetrically significant seed/strand movements within prostate (apart from those associated with edema) point to the technical aspects of implant technique as possible explanations for the observed movements. Saibishkumar et al. note that puncturing the bladder wall when introducing a needle likely increases the risk of seed loss via the urinary tract. Likewise, McLaughlin et al. and Pinkawa et al. suggest that placing a strand proximal to the prostate apex into the levator ani muscle could result in subsequent inferior movement of the strand when the muscle contracts. If the hypothesized seed movement mechanisms are correct, then modification of implant technique to avoid them seems most appropriate. 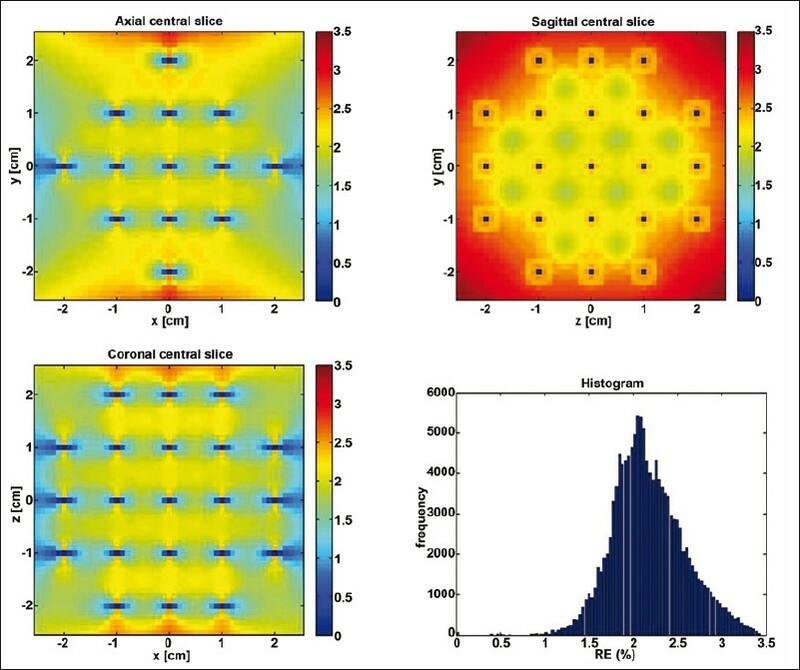 If dosimetrically significant intra-prostatic seed movements cannot be mitigated through modification of implant technique, then it might be possible to account for them using dynamical dosimetry. , In this approach, imaging is performed at multiple time points after the implant and dose is calculated based on the measured dynamics of the seed configuration. One obvious drawback is the added time and expense involved. For comparison purposes, a reference RE distribution was calculated for a configuration of seeds defined by the Radiological Physics Center to credential institutions participating in North American prostate brachytherapy clinical trials. 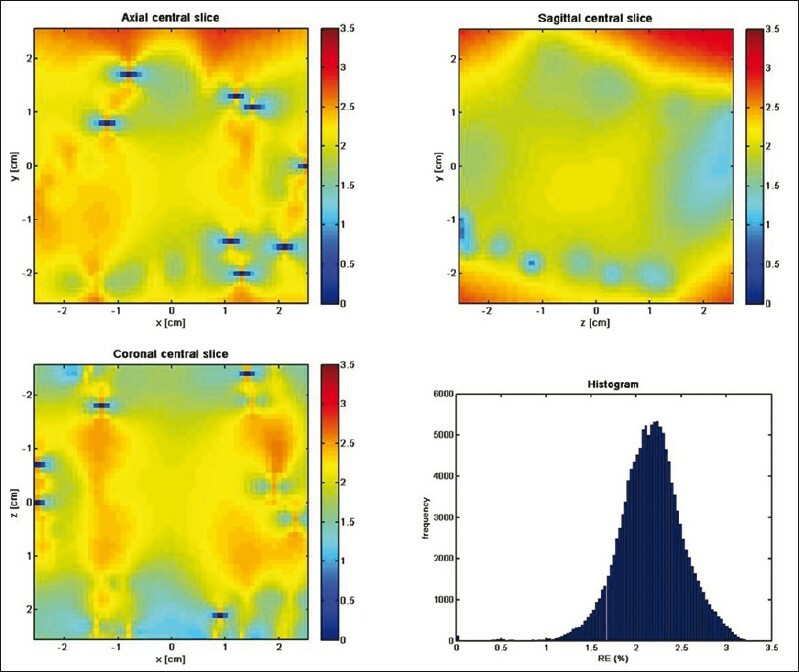 [Figure 4] depicts the reference seed configuration and [Figure 5] the associated distribution of RE values in the 50 × 50 × 50 mm 3 calculation volume for I-125 seeds (Oncura model 6711) obtained using the anisotropic edema model with Δ = 0.2 and T = 28 d. These edema parameters reflect average clinical values measured for patients implanted at our center. A number of features of the RE distribution are evident. First, the median RE value is small, being just over 2%. This is a consequence of radionuclide half-life and dose fall-off with distance, edema magnitude, and edema half-life. Second, RE ranges from near 0% to about 3.5%. This variation occurs because the effect of edema is minimal very close to a seed and increases in a directionally dependent manner at greater distances from it. Third, the greatest impact of edema is seen near the periphery of the seed configuration in the central sagittal slice. This feature arises from the spatially anisotropic nature of the edema, which is negligible in the left-right direction (x axis) and of equal magnitude in the anterior-posterior (y axis) and superior-inferior (z axis) directions (see Equation (2)). [Figure 6], [Figure 7] and [Figure 8] present the distributions of RE values calculated for post-implant dose distributions for the 18.9 cc, 37.6 cc, and 60.2 cc prostates, using the same edema parameters as for the reference seed configuration of [Figure 4]. In comparison with [Figure 5], the RE distributions for actual implants display both similarities and differences. RE median values and ranges for all three prostates are very close to those for the reference seed configuration, and larger values of RE continue to be seen surrounding the periphery of the seed configuration in the central sagittal slice. 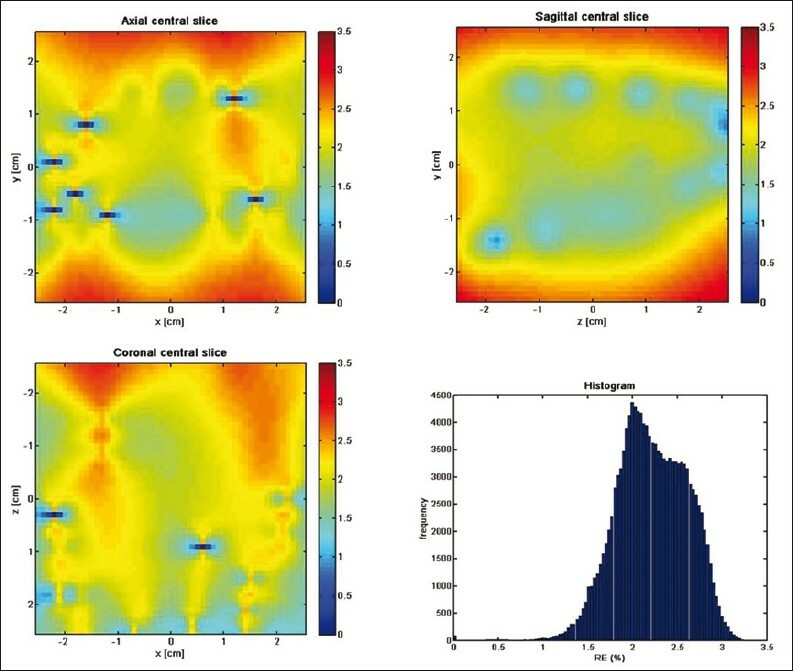 However, the RE distributions in the central axial and coronal slices, and throughout the calculation volume, clearly exhibit some degree of variation from implant to implant. This variation apparently stems from differences in the seed configurations. A summary of volume-averaged RE values for all of the clinical seed configurations as well as the Radiation Therapy Oncology Group (RTOG) reference seed configuration appears in [Figure 9]. In addition to the average over the full calculation volume, the average over the highest 10% of RE values in the volume is presented. For comparison, the value of RE obtained using the isotropic edema model of Chen et al. adapted for linear time resolution (see Equation (2)) is also shown. It can be seen that for I-125 seeds and the edema model parameters characterizing the implant technique at our center, both the RTOG reference seed configuration and the isotropic edema model yield average RE values in the calculation volume not too different from those for the clinical implants obtained using the isotropic edema model. [Table 2] summarizes the influence of edema on implant dose parameters as determined using the edema model. For the clinical pre- and post-plans done using I-125 seeds, D 90 values for PTV and prostate are reduced, but by no more than 2.5%. Corresponding V 100 values are likewise reduced, typically by ~0.5% but by no more than 1.7%. By comparison, D 90 values for the simulated Pd-103 implant created by using the mid-sized prostate I-125 seed locations and scaling the seed strength are reduced by 7.5% for the pre-plan and 6.6% for the post-plan. Finally, [Figure 10] illustrates how volume-averaged RE values change with increasing edema magnitude for I-125 and Pd-103 implants. At small values of Δ, < RE > increases nearly linearly with Δ for both radionuclides and is considerably greater for Pd-103 than for I-125. The latter feature is explained by the shorter half-life and steeper dose fall-off with distance of Pd-103. Thus, it can be seen that the effect of edema on dosimetry can be minimized by using I-125 seeds and by refining implant technique so that the number of needle manipulations and consequently the maximum edema magnitude is reduced. In circumstances where the effect of edema is deemed not to be negligible from the clinical standpoint, the dose calculation approach outlined in Section "Anisotropic edema model" can be used to explicitly account for edema in either pre- or post-implant dosimetry. One way to accomplish this would be to measure Δ and T for a cohort of patients treated with a given technique and then apply the average values prospectively to dosimetry for all patients treated with that technique, as illustrated here. Although edema parameters are expected to differ somewhat from patient to patient, it can be argued that using population-averaged parameter values yields more accurate dosimetry than neglecting edema entirely. Another approach would be to try and establish relationships between edema parameters and surrogate variables, such as number of needle manipulations or prostate volume, and to select edema parameters for each patient individually based on those relationships. A survey of indexed literature indicates that reported population-averaged values for prostatic edema maximum relative magnitude vary from 0.1 to 0.7 and for edema half-life they vary from 9.3 to 30 d. Furthermore, the time resolution of edema has been variously reported as being inverse exponential, linear, and having no discernable pattern. For the most part, these studies relied on a combination of imaging modalities, primarily US and CT, to measure edema characteristics. Recently, our center used serial MRI to make similar measurements for our implant patient population. An average edema maximum relative magnitude of 0.2 that resolved linearly in time with an average half-life of 14 d and a spatially anisotropic distribution of edema were found. The broad range of values associated with earlier measurements is likely due in part to uncertainties associated with contour definition and seed localization. A second literature survey looking at intra-prostatic seed movement apart from that caused by edema indicates that investigators are equally divided in detecting or not detecting seed movement sufficient to affect dosimetry. Many of those reporting such movement note that it appears to be associated with specific technical aspects of the implant procedure such as puncture of the bladder wall or placement of the proximal end of a seed strand into the levator ani muscle. These observations suggest that seed movement could be effectively limited by modification of implant technique. To date, approaches to compensate for the effect of edema on dosimetry have included increasing seed strength, introducing all needles prior to intraoperative treatment planning and needle loading, and timing post-implant imaging to minimize dosimetry error estimated using a simplified model for edema. Although the latter approach is currently recommended by AAPM and GEC-ESTRO practice guidelines, many centers routinely perform post-implant dosimetry on day 0 or day 30 for reasons of practicality and convenience. None of these approaches provides a direct means to correct dosimetry for the effect of edema. In this work, a new anisotropic edema model incorporating locally measured edema parameters (Δ = 0.2, T = 28 d) was used to calculate the relative dose error RE associated with neglecting edema for three I-125 seed implants done at our center. Pre- and post-plan RE average values and ranges in a 50 × 50 × 50 mm 3 calculation volume were similar at ~2% and ~0-3.5%, respectively, for all three implants; however, the spatial distribution of RE varied for the different seed configurations. Additional RE calculations done for a reference configuration of seeds and for an isotropic edema model were in good agreement. Corresponding reductions in post-plan dose parameters D 90 and V 100 for the clinical implants were ~2% and ~1%, respectively. Although the magnitude of RE values calculated here for I-125 implants done at our center is relatively small, it increases with edema magnitude and can be substantially greater when Pd-103 seeds are used. In cases where RE is deemed not to be negligible, the dose calculation method described here can be applied to explicitly account for edema in both pre- and post-implant dosimetry, thereby improving the accuracy of clinical dose estimates used in implant quality assessment. 1. Holm HH, Juul N, Pedersen JF, Hansen H, Strøyer I. Transperineal 125-iodine seed implantation in prostatic cancer guided by transrectal ultrasonography. J Urol 1983;130:283-6. 2. Peschel RE, Colberg JW. Surgery, brachytherapy, and external-beam radiotherapy for early prostate cancer. Lancet Oncol 2003;4:233-41. 3. Bowes D, Crook J. A critical analysis of the long-term impact of brachytherapy for prostate cancer: A review of the recent literature. Curr Opin Urol 2011;21:219-24. 4. Nath R, Bice WS, Butler WM, Chen Z, Meigooni AS, Narayana V, et al. AAPM recommendations on dose prescription and reporting methods for permanent interstitial brachytherapy for prostate cancer: Report of Task Group 137. Med Phys 2009;36:5310-22. 5. Salembier C, Lavagnini P, Nickers P, Mangili P, Rijnders J, Polo A, et al. Tumour and target volumes in permanent prostate brachytherapy: A supplement to the ESTRO/EAU/EORTC recommendations on prostate brachytherapy. Radiother Oncol 2007;83:3-10. 6. Monajemi TT, Clements CM, Sloboda RS. Dose calculation for permanent prostate implants incorporating spatially anisotropic linearly time-resolving edema. Med Phys 2011;38:2289-98. 7. Butler WM, Merrick GS, Lief JH, Dorsey AT. Comparison of seed loading approaches in prostate brachytherapy. Med Phys 2000;27:381-92. 8. Blasko JC. Low-dose-rate brachytherapy for prostate cancer: Preplanning vs. intraoperative planning - Preplanning is best. Brachytherapy 2006;5:139-42. 9. Zelefsky MJ, Zaider M. Low-dose-rate brachytherapy for prostate cancer: Preplanning vs. intraoperative planning - Intraoperative planning is best. Brachytherapy 2006;5:143-4. 10. Sloboda RS. Intermediate seed strengths are preferable for I-125 permanent prostate implants, unpublished observations submitted to Brachytherapy, 30 September 2011. 11. Sloboda RS, Usmani N, Pedersen J, Murtha A, Pervez N, Yee D. Time course of prostatic edema post permanent seed implant determined by magnetic resonance imaging. Brachytherapy 2010;9:354-61. 12. Chen Z, Yue N, Wang X, Roberts KB, Peschel R, Nath R. Dosimetric effects of edema in permanent prostate seed implants: A rigorous solution. Int J Radiat Oncol Biol Phys 2000;47:1405-19. 13. Eapen L, Kayser C, Deshaies Y, Perry G, Choan E, Morash C, et al. Correlating the degree of needle trauma during prostate brachytherapy and the development of acute urinary toxicity. Int J Radiat Oncol Biol Phys 2004;59:1392-4. 14. Villeneuve M, Leclerc G, Lessard E, Pouliot J, Beaulieu L. Relationship between isotope half-life and prostatic edema for optimal prostate dose coverage in permanent seed implants. Med Phys 2008;35:1970-7. 16. Prestidge BR, Bice WS, Kiefer EJ, Prete JJ. Timing of computed tomography-based postimplant assessment following permanent transperineal prostate brachytherapy. Int J Radiat Oncol Biol Phys 1998;40:1111-5. 17. Dogin N, Najeeb M, Glasgow GP, Keys K, Flanigan RC. Effect of prostatic edema on CT-based postimplant dosimetry. Int J Radiat Oncol Biol Phys 2002;53:483-9. 18. Roberson PL, Narayana V, McShan D, Winfield RJ, McLaughlin PW. Source placement error for permanent implant of the prostate. Med Phys 1997;24:251-7. 19. Fuller DB, Koziol JA, Feng AC. Prostate brachytherapy seed migration and dosimetry: Analysis of stranded sources and other potential predictive factors. Brachytherapy 2004;3:10-9. 20. Potters L, Wang XH, Yamada Y. A nomogram to compensate for intraoperative prostate edema during transperineal brachytherapy. Tech Urol 2000;6:99-103. 21. 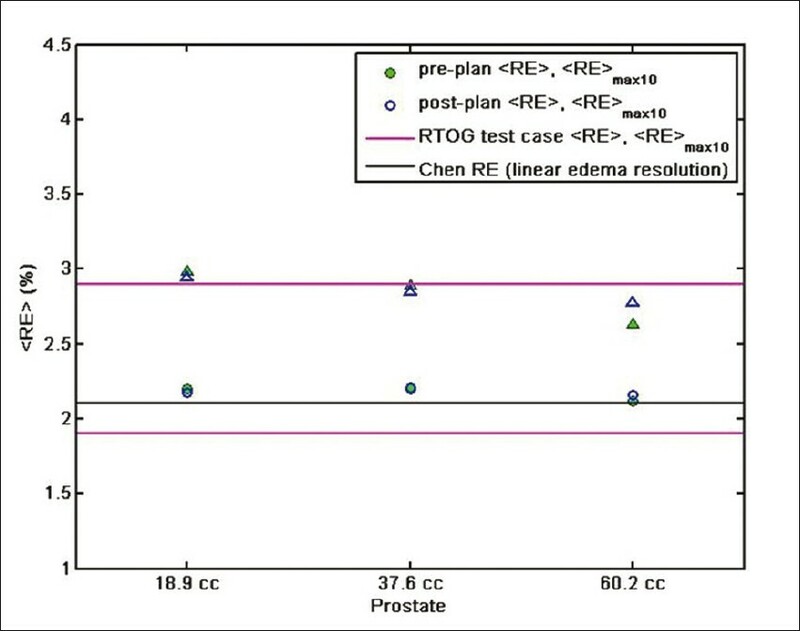 Smith RP, Beriwal S, Komanduri K, Gibbons E, Benoit R. Planning based on postneedle volume with early dosimetric assessment is beneficial for Cesium-131 permanent prostate seed implantation. Brachytherapy 2008;7:237-41. 22. Chen Z, Deng J, Roberts K, Nath R. Potential impact of prostate edema on the dosimetry of permanent seed implants using the new 131Cs (model CS-1) seeds. Med Phys 2006;33:968-75. 23. McLaughlin P, Narayana V, Pan C, Berri S, Troyer S, Herman J, et al. Comparison of day 0 and day 14 dosimetry for permanent prostate implants using stranded seeds. Int J Radiat Oncol Biol Phys 2006;64:144-50. 24. Pinkawa M, Asadpour B, Gagel B, Piroth MD, Borchers H, Jakse G, et al. Evaluation of source displacement and dose-volume changes after permanent prostate brachytherapy with stranded seeds. Radiother Oncol 2007;84:190-6. 25. Saibishkumar EP, Borg J, Yeung I, Cummins-Holder C, Landon A, Crook J. Sequential comparison of seed loss and prostate dosimetry of stranded seeds with loose seeds in 125I permanent implant for low-risk prostate cancer. Int J Radiat Oncol Biol Phys 2009;73:61-8. 26. Usmani N, Chng N, Spadinger I, Morris WJ. Lack of significant intraprostatic migration of stranded iodine-125 sources in prostate brachytherapy implants. Brachytherapy 2011;10:275-85. 27. Vassiliev ON, Kudchadker RJ, Swanson DA, Bruno TL, van Vulpen M, Frank SJ. Displacement of periurethral stranded seeds and its dosimetric consequences in prostate brachytherapy. Brachytherapy 2011;10:401-8. 28. Leclerc G, Lavallée MC, Roy R, Vigneault E, Beaulieu L. Prostatic edema in 125I permanent prostate implants: Dynamical dosimetry taking volume changes into account. Med Phys 2006;33:574-83. 29. Steggerda MJ, Moonen LM, van der Poel HG, Schneider CJ. The influence of geometrical changes on the dose distribution after I-125 seed implantation of the prostate. Radiother Oncol 2007;83:11-7.